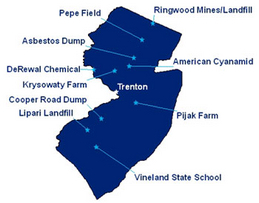 The American Cyanamid Superfund Site is located in Bridgewater Township, New Jersey and was added to the National Priorities List in 1983 after contamination was found at the site. Prior owners used the 575-acre site for numerous chemical and pharmaceutical manufacturing operations for more than 90 years, resulting in the contamination of waste disposal areas (referred to as impoundments), soil and groundwater with volatile organic compounds (VOCs), semi-VOCs, and metals. In 1998, EPA deleted a 140-acre portion of the 575-acre site from the National Priorities List, leaving 435 acres to be addressed. The 140 acre parcel of land, which primarily consisted of administrative and laboratory buildings, has been redeveloped for commercial use. All manufacturing at the site stopped in 1999, with most buildings demolished by 2000. Wyeth Holdings LLC, a subsidiary of Pfizer Inc., acquired the site in 2009 and assumed responsibility for its cleanup. The long-term cleanup of the site is ongoing.